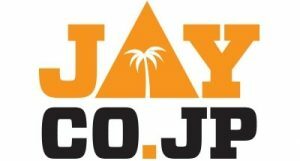 [JC] IECC wins Last ball thriller in the opening T20 Japan Cup. A Nail-biting finish on TV is always thrilling and nerve wrecking. The final over and particularly the final ball deciders are not for the weak-heart. Watching the game and being the part of the game are two worlds apart. When you are actually involved in it, the feeling of pressure going through cannot be described. Typically, what would a nervous player at a club level think? Umpires: Either all senses become numb or far more sensitive to identify any edge or give correct decisions on run outs. Everyone in the park including the spectators feel the pressure. I hope you can imagine the feeling that always go through the players’ mind. The difference IECC had at this particular moment was entirely opposite. Every fielder was alert to take the catch, two bowlers wanted to bowl the final over and take responsibility of winning.When a team has this kind of mindset, calmness & attitude to not to give up till last ball, I am sure everyone felt & will feel proud to be part of this team including supporters and junior members.There was excitement in the group for the first match of the season. Vinay announced the team few days back and few members even had a practice session in Tsukuji. The excitement was obvious as all members & few families arrived at YC&AC around 12:15 ~12:30 noon. Kobayashi fresh from National team duties, led the warm up & practice sessions. 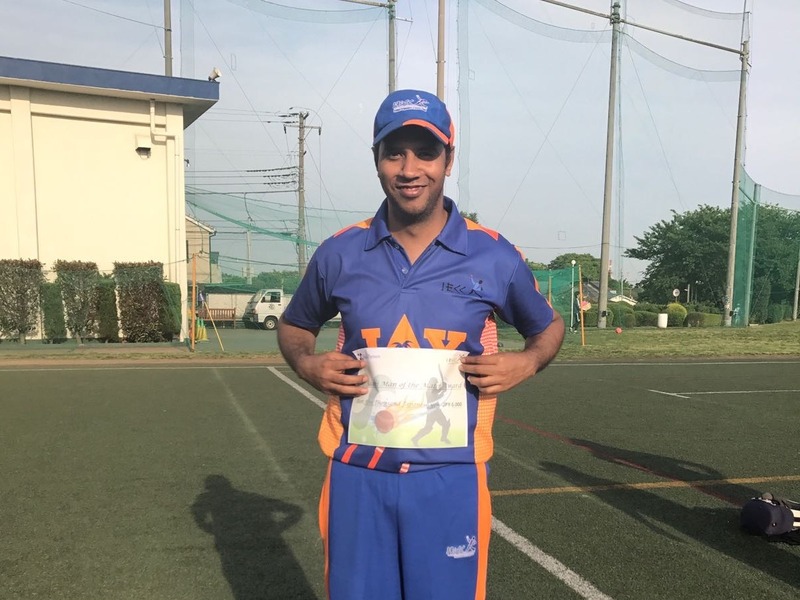 Umpires from Aoyama Gakuin Cricket Club (Hidehiko Matsuchika & Hiroyuki Takayanagi) were more excited as they were going to key men this pressure match. This year’s Japan cup teams were divided in such a way that only the top team from each group qualifies for the final. IECC was placed along with ITCC, Keio, Aoyama Gakuin and British embassy teams. Considering the previous year matches, toughest opponent was ITCC and it proved to be. Praveen ram took the responsibility of scoring and Saif (12th man) ensured that everyone in the Team is aware of the stats situation after every over. ITCC captain Saborish won the toss and elected to field first. IECC captain Vinay wanted to bat first, so it was win-win situation for both teams. Considering the form, our batting line was shuffled. Pavethy and Prashant kale opened the batting together for the first time. 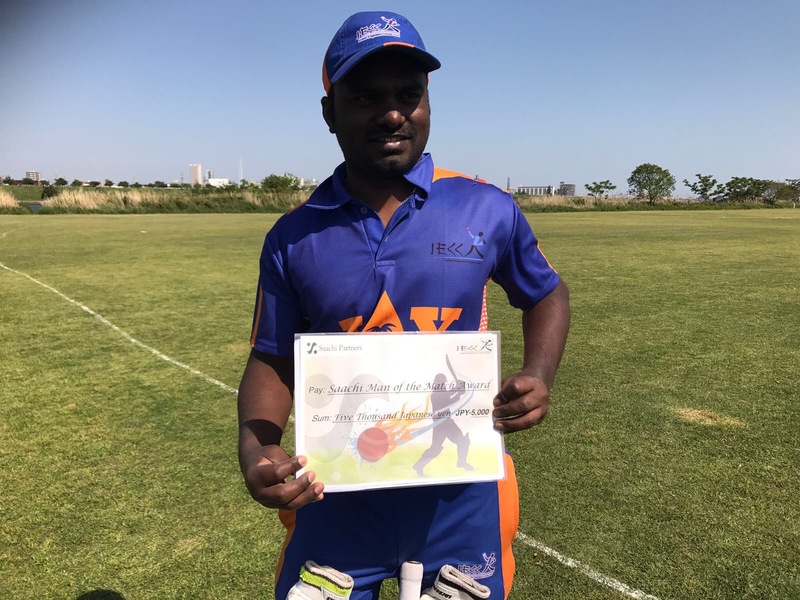 ITCC opening bowler, Ragesh Nair, felt the crucial game pressure straight away as he bowled 13 wides’ in the first over and gave a hard time for the wicket keeper on both sides of the stumps. The Umpires were already tired of giving away wide to an extent that he refused to give a wide in an attempt to complete the first over. Normal proceedings followed in the second over. The new Flex pitch was just laid on artificial grass of YC&AC meant that ball stopped and bounced awkwardly in first few overs. Prashant Kale was cautious initially and did not find the middle of his bat. Pavethy at the other end had no trouble whatsoever. He started dispatching short and wide deliveries to all parts of the ground. Looked like both were playing on 2 different surfaces. At the end of power play IECC were 42/0 in 6 overs. In the 7th over, they brought 50 runs partnership. Soon later, Pavethy (31runs) chased a wide ball, aiming to go over the infield, but sliced it straight to point fielder. Dinesh joined Prashant Kale in the middle and tried to build-up the partnership. In an attempt to take risky single, a direct hit saw Prashant kale (6 runs) returning to pavilion. IECC batting line up goes deep till number 10 so everyone was excited to go out there and perform for the team. Kobayashi at no 4 instantly found his timing and started carting the bowlers. Dinesh (9 runs) could not connect the slow, short ball and pulled it straight up in the air and got out. Abhishek (24 runs), our star in the team took the responsibility of building the partnership with Kobayashi. After a steady 30runs partnership, Kobayashi (38 runs) fell to a loopy leg spin, giving a catch. Vinay (0 runs), usually ever reliable was caught at covers in the very next delivery, without disturbing the Score and suddenly the tigers felt the upper hand. Raman (6 runs) and Prashant Kumar (9 runs) both tried to increase the run rate and perished in vain. With the last 10 overs yielding only 81 runs at the end of 20 overs IECC posted a below average total of 144 Runs. It was a challenging total considering a slow pitch and our bowling line up. It was the right motivation and gave the team a chance to gather together, decide next action to curb the run rate and bowl lot of dot balls. Meanwhile the other opening batsman was having his day on the field, in between few good shots, often found catches dropped short of fielder or over the fielders. Prashant kale & Pavethy replaced Vinay and Abhishek, in search of another Breakthrough. Pavethy produced the second breakthrough. Being dropped of previous ball, he bowled the inform batsman the next delivery. The other ITCC batsman kept their team in the hunt of the total with slogs and mistimed shots over the fielders. In T20 Games, Runs matter, whichever way they come. The fielders who gave IECC batmen suggestions to play straight in “V” with footwork were themselves clueless against some good bowling. Only thing they knew were cross batted slogging and they succeeded in it. YC&AC outfield is made of synthetic grass, so anything going past the fielder is a certain boundary. Pavethy knew how to bowl in these conditions and started picking wickets with his variations. Any over with less than 5 runs was a match winning over. Abhishek finished his spell with excellent figures of 4-0-22-1. At the end of every over, Saif was informing the updated score, target and run rate. Great team man to have in this situation. 15 required of last 2 overs. Raman did his best and gave way only 7 runs. Boundary scored of him was again the cross batted hook over square leg. Pavethy took the responsibility of bowling the last over. Game went into overtime and made YC&AC support staff nervous. 1st ball : Drama started with a mankading appeal. The non-striker was backing up too much and Pavethy was quick to notice it and took the bails. According to the rules it was out but IECC decided to warn the batsman and withdrew the appeal. Meanwhile the Tigers dugout went raucous and started abusing. 2nd ball: single and the inform batsman was on strike the next delivery. 3rd ball: dot + wicket. Batter tried to hit straight and was excellently caught and bowled by Pavethy. 5th ball: 2runs. a bit flight and the batsman slogged it to Deep Mid-wicket but Prashant Kale was fast enough to stop the ball cross over the boundary to save 2runs. So it came to last ball of the match.1 to tie and 2 to win. Last year IECC already had a tie game, so was History going to repeat? Anticipating chance of run out, Prashant Kumar behind the wickets moved a few steps back. Smart move & good thinking by him. I guess the batsman was more nervous at that moment. 6th ball: Pavethy bowled a flatter, faster one and the batsman missed it. The Non-striker was almost at the half of the pitch trying to take a single, Prashant Kumar keeping his calm, collected it cleanly and took the bails of the Stumps. RUN OUT+ Dot ball. IECC pulled off a sensational win. Thanks to ITCC for giving a good fight. Good to win such tough matches. It gives more understanding of team work, execution and motivating each other through tough periods in the match. 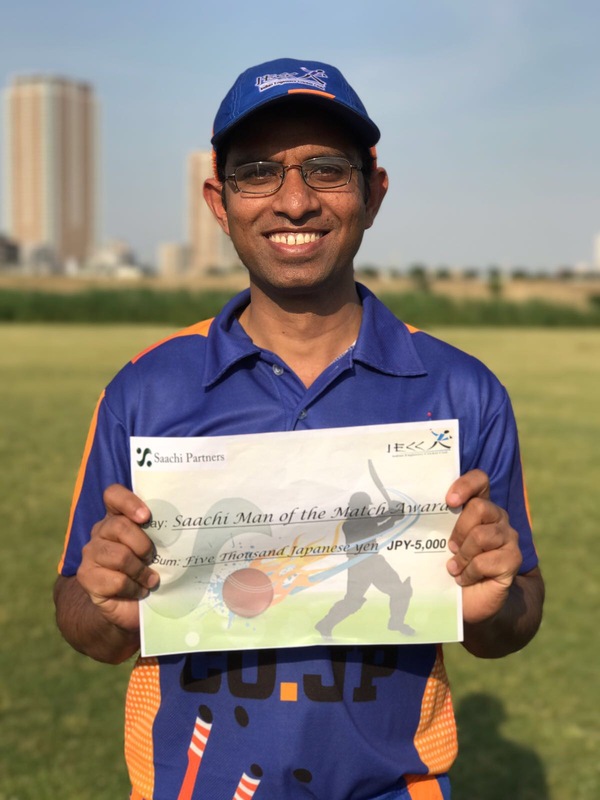 Pavethy, for this all-round performance was adjudged “Saachi Partners -Man of the match”. 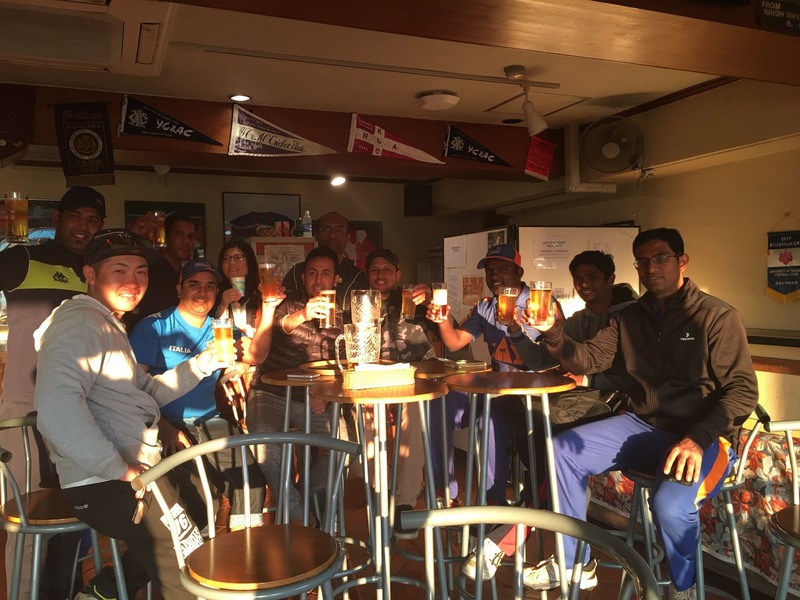 The victorious lads spent some good time reliving their nail-biting moments in YC&AC sports bar. 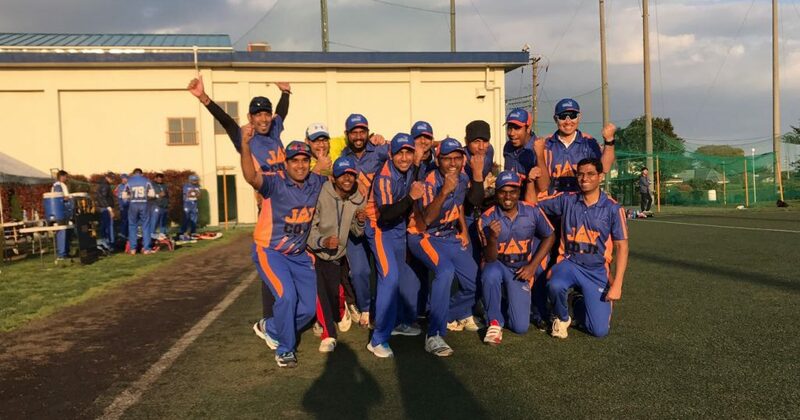 This is certainly a wonderful start to 2017 season and this win meant IECC keep their hopes alive to top the group and enter Japan Cup “South Kanto” finals.